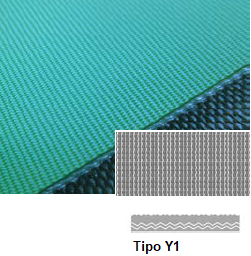 Esbelt Hipro belts double life span compared to other PVC belts. Double resistance to abrasion and mineral oils. HPVC on cover side (special high performance PVC). Resistant to chemical products, diesel, mineral oils, acids and alkaline solutions (except ketone and chlorinated solutions). 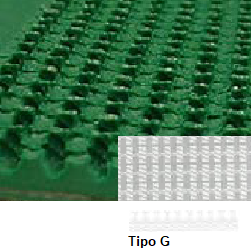 Bottom cover conductive resin fabric, resistant to abrasion and external environmental factors..
Antistatic according to ISO 284 standards. Vulcanised splice or fastener joints..
Esbelt´s Hipro series belts are designed for applications where there is high wear caused by friction between the belt and product due to high usage or speed of the conveyor. 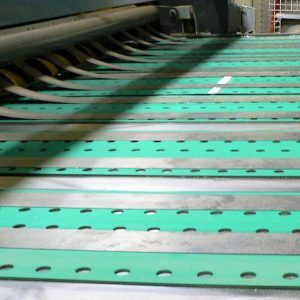 The ability to vulcanise the belt ends makes Hipro belts a more efficient choice than elastomer belts as less time is required to join the belts compared to elastomer or rubber belts which require more time to cure the belt joints. HPVC Topcover with Pattern Y1. Bottom low noise fabric with conductive resin. HPVC Topcover with Pattern G.
Bottom fabric with conductive resin. High resistance to abrasion, chemicals.